Young witches often have chaotic schedules and it's for the best. It's preferred that witches keep their noses buried inside Herbology books instead of daydreaming about the Hufflepuff's Quidditch team captain. There's plenty of time to concoct love potions later on in life but for now, basic witch and wizarding pursuits are the top priority. If you're looking for an essential garment that is perfect to wear for all your daily activities like memorizing disarming spells with fellow classmates, learning the fundamentals of flying, and frolicking through the villages of Hogsmeade then this skirt is perfect for you. The Harry Potter Gryffindor skirt is a prime combination of preppy and practical making it great for a variety of activities, whether it's related to magic or Muggle-related. 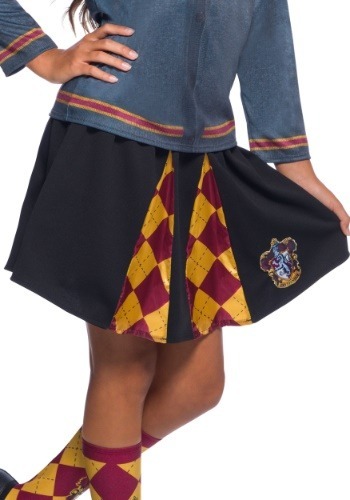 The officially licensed Gryffindor skirt features a comfortable elastic waistband making it a flattering garment for all girls. The officially licensed skirt has many pleats, the traditional Gryffindor emblem, and a burgundy/gold argyle-style print. Use this child-sized skirt to conjure your very own Gryffindor costume. Pick up the coordinating socks, cardigan, and tie to get the complete cinematic-inspired look. Carry a wand prop for authenticity while your candy sack magically fills up with treats and goodies.